When you are building your brand and your business online, one of the most important elements to monitor is your online reputation. 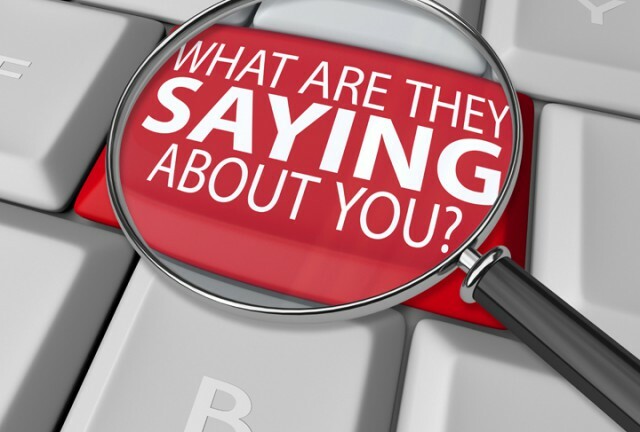 If you know anything about online reputation management, you know, essentially, it’s the process of monitoring and managing what people are saying about you and your company. Online, as in real life, word of mouth is one of the most potent methods for spreading good news (and bad). While there are many paid services to help you monitor your online reputation, there are several free tools you can (and should be) using to keep track of your mentions on the Web. Google Alerts – You would set these up for your name, your business name, and any key terms or initiatives you might also be monitoring. Using this free service enables you to be notified whenever there is a new Google listing for any of your keyword terms. You can set how often you should be notified (I have mine set to daily), and you can set up as many alerts as you would like. It’s wise to use your desired keyword term in quotes (as in “red cars” rather than red cars), as this increases the specificity of your alerts. Google alerts are a good first-line listening tool to monitor your online reputation. Social Mention – To use this service, you simply go to the website and enter in the keyword you’d like information on. They source the social web and send you a one-page summary of your mentions, as well as a measurement of your reach, how passionately people are discussing you and the ratio of positive to negative comments about you. Addictomatic – To use this service, go to the website and enter a keyword you’d like information on. This site is great because it pulls from many content sources, and you can get a one-page listing of your keyword as it appears on various sites. You can remove or switch around the order of results. What I like to do with this site is set up some custom keyword searches and then bookmark them in my browser. This way, I can easily return, at a glance, whenever I’d like to be updated on new information on my keywords. This site also finds mentions that are new and different than other sites. Setting up your alerts and searches is a good first step in monitoring your online reputation. It’s always good to know what people are talking about — especially if it’s you. IVR Or VoIP, Which Phone System, Is Right For You? Sweet! what a collection. Helps fill the gap in my arsenal. Great work. Thanks a lot for the link of the blog. I will consider it. Hopefully, I will see you more on TechnoGiants. Can these tools monitor only reputation or can they give a chance to examine a site or the web applications that are used? If you want to know all about the website then please use ‘http://www.worthofweb.com/’ website as it will give you the complete details related to the searched website.